Happy Kitchen Sink Stamps Monday, I hope you had a great weekend! It's great to see so many new members over at the KSS Forums, jumping in playing along with the daily challenges and uploading their KSS creations to the gallery! A special thank you to Barbara Washington, our Guest Designer this month, it's been wonderful having your share your KSS creations with us! Beautiful sympathy card. Love the paper paired with the pretty image. Beautiful card for any occasion. Love those little scallops peeking out the bottom edge. That is beautiful, Lisa! The color of the tree pops off the page. What exquisite work on this gorgeous sympathy card, Lisa! I love the deep, rich colors on this wonderful design! Wow this is so pretty Lisa! Wonderful take on the sketch and perfect image for the sympathy card. Beautiful Lisa! I love the layout and papers. 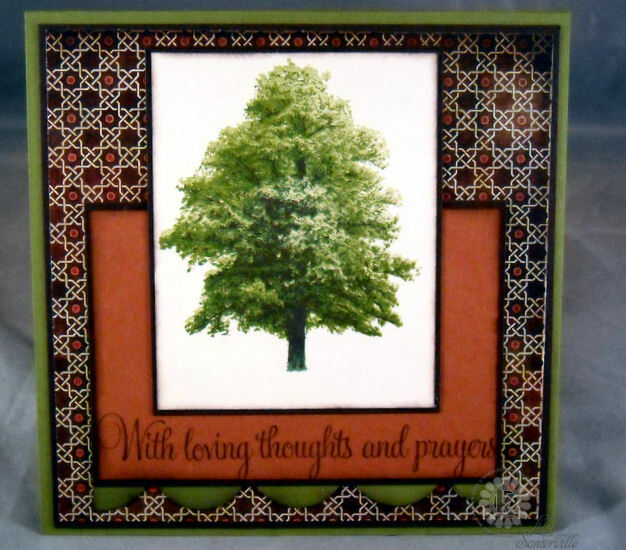 The tree is a wonderful image to use for a sympathy card. Hope you are staying warm! What an amazing card! The rich colors are amazing. Your tree is wonderful Lisa - what a lovely sympathy card! Beautiful card. The image is stunning...so life like. Lisa, this is such a wonderful sympathy card. I have such a hard time with masculine sympathy cards, and this is just perfect! Thanks for the inspiration! Hugs!! For some strange reason, I'm attracted to trees in stamping and this one is fabulous, so life-like! Beautiful sympathy card. 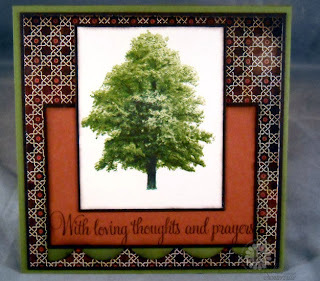 I never thought to use that tree for a sympathy card, but it really works. Such a beautiful Sympathy card with a masculine touch. Love the subtlety of the scalloped edge.